The boundary and land of Vietnam had expanded continuously from the date of country’s creation in about 2000 BCE and they were fixed only in the 18th century. Vietnam is a small country as compared to its neighbors in Asia such as China, India, Indonesia, Myanmar and Thailand. The river systems in the country have created large and small deltas that are suitable for rice production. However, the country is divided into different distinct region by series of mountains and hills which occupy about 2/3 of the country’s land. Consequently, the conditions of rice production vary greatly from region to region in the country. In addition, the growth of rice plants is also affected by insects, diseases, weeds and other organisms. The following pages introduce the challenges and difficulties of rice production in Vietnam. Vietnam today extends from 8.30 to 23.220 N latitudes and 102 to 1100 E longitudes and generally the climate in the country is suitable for rice plants to grow and to produce at least one crop in a year. However, the variability in climate factors such as temperature, rainfall and its distribution, storm and solar radiation with time and space may have important effects on the growth, development and yield of rice plants. The great part of Vietnam lies in tropical climate with seasonal winds. The temperature regime in tropical climate areas allow the successful growing of rice throughout the year. The annual average temperature increased from about 23.5 0 C in northern region to about 27.5 0 C in southern region. At Sa Pa (1,500 m above sea level) temperature could goes down to below 00 C in December. From Thừa Thiên Province to the North, there is generally a cold/winter season from December to February as in Thừa Thiên and Quảng Trị Province or from December to March in the Red River Delta. During the winter season, the mean temperature in these places sometimes goes below 210C (FAO, 1987). The low temperatures affect negatively on growth and production of rice plant. During the reproductive and flowering stages, temperature at 210C and below causes grain sterility. Damage due to low temperatures extended to several hundreds of thousands of hectares in the Red River Delta during the winter-spring season of 1995-1996 (Nguyễn Văn Ngưu, 1996). Farmers in the Red River Delta tell each other. The Vietnamese Mountain Chain (Trường Sơn) reaches out and approaches the East Sea at different places in the part between Hà Tĩnh and Quảng Nam. In Hà Tĩnh there is the Đèo Ngang Pass. The poet Đoàn Thị Điểm wrote the following lines. Between Thừa Thiên Province and Quảng Nam Province, there is the Hải Vân Pass with the highest peak at about 2000 m above sea level. The following ca dao wrote about the Hải Vân Pass. The Ngang and Hải Vân Passes block the cold wind from the North. Therefore, from Quảng Nam Province to the South, the monthly mean temperature is always above 210C and actually in the Southern Region, mean monthly temperature change from 250C to 280C. Temperature, therefore, is not a constraint of rice production in Southern Region. The amount of yearly rainfall in all Vietnam is substantially large, increasing from about 1,600 mm in Hà Nội to about 2,900 mm in Huế and then decreasing to about 1,600 mm in Qui Nhơn. In Nha Trang and Phan Rang, the annual rainfall amount is about only 700 mm, while in the Mekong River Delta and Southern Region, it is about 1,900 mm (FAO, 1987). In general, the amount of rains in most of Vietnam is good enough for production of one rice crop. In the past when irrigation was not available, farmers waited for rain to start their rice production activities as it is expressed in the following ca dao. However, the distribution of rainfall at a certain place may vary from time to time in a year and this could cause drought at sometimes and flood at other times. Flood and drought were two major constraints of rice production in the past. Bùi Huy Đáp (1985) reported that 43 severe drought and 37 heavy flooding in Vietnam. Floods are the most important weather-related constraint of rice production in Vietnam. Most rice varieties can stand complete submergence for 6 days before 50% of rice plants in a field die, but the mortality is 100% when submergence period lasts 14 days or more. Floods also destroy houses and means of production own by farmers and dams, dikes, roads, and other infrastructures. Most of the rivers in provinces in Central Region of Vietnam are generally short and their delta are small. During rainy season, the river water often raises up quickly and causes flooding after a few heavy rains. In Huế City, there was the following popular saying. The amount of rainfall in October and November in the provinces from Vinh to Qui Nhơn was generally plenty and is about 40% of the annual amount of rainfall in these provinces (FAO, 1987). About 500 to 900 mm of rainfall was obtained in some days in October and November in these provinces (Trần Trọng Thuỷ 1977) and this could cause severe flood in these places. The Musician Phạm Duy wrote these following lines about flood in Thừa Thiên-Hue Province. The Red River Delta was the rice bowl of Vietnam from the country formation to 18th century. It has a triangle shape and is surrounded by mountains. Before the construction of Hòa Bình Dam, the Red River pour about 700 cubic meters/sec during winter and about 28,000 cubic meters/sec during summer. In the past, several areas in Red River Delta were flooded annually. According to Cima (1987), the deepest points of flood in the Red River Delta in the 19th and 20th centuries was about 14 m.
After the southward expansion of the country in 18th century, the Mekong River Delta was the principal rice bowl of Vietnam. The total length of the Mekong River in Vietnam is about 220 to 250 km and the River has two main branches in Vietnam – Tiền Giang and Hậu Giang and exits to the East Sea via 9 mouths with an average amount of 120,000 cubic meters/sec (Gourou, 1973). Some areas in Mekong River Delta are flooded annually in the months of September and October due to the high amount of water come down from upstream and the tidal waves. The tidal water sometimes reaches to about 200 km inland in Mekong River Delta (Nguyễn Ngọc Thuỷ, 1977). The flooding area in the Mekong River Delta was reduced thanked to the digging and building of canals, but recently it was increased under the influence of climate change. Although the annual rainfall is generally adequate for rice production in many areas in Vietnam, but it distributes unevenly so that drought could occur in many rainfed rice area. Growth and yield of rice are generally negatively affected by drought. In tropical climate area such as that in Vietnam, rice yield is closely related to the sunshine radiation during the last 45 days of rice crop (Nguyễn Văn Ngưu and S.K. De Datta, 1979). The low level of solar radiation during the period from October to December overall the country, which is 220 to400 cal/sq cm/day, has negative effect on rice yield of main rice crop. The Red River Delta is usually affected by tropical storms during August and September. The central provinces from Nha Trang to Nghệ An Provinces receive about 7 to 10 storms annually that comes from Philippines and East Sea during the period from August to December. Losses of rice due to stormy weather in these central provinces are estimated to be several hundreds of thousand tons per year. Tropical storms are rarely reach Southern Region and Mekong River Delta. However, in 1904 a strong storm severely damaged crops and houses in Gò Công (Huỳnh Minh, 1969). The above lines from a popular song indicate the difficulties and constraints from land and soils to rice production in Vietnam. Based on their water or moisture conditions, rice soils are grouped into (a) dry land or upland and (b) wetland or lowland rice soils. In Vietnam lowland rice is dominant. Soils of lowland rice are further classified into alluvial soils, degraded alluvial soils, acid sulfate soils, organic soils, and saline soils. Majority of upland rice soils have low level of fertility. The poor upland soils include Lithosols, Orthic Acrisols, Ferric Acrisols, Chromic Luvisols and Calcic Cambisols (FAO, 1988). They are generally acidic and subject to erosion after the cover vegetation was cleared for cultivation. Stone and rock outcrops generally are major constraints to the production of annual crops, including rice, on these soils (Dent, 1980). The fertile upland soils are found in about 1.8 million ha in central highlands. They were formed from basalt, poryphyritic and diabase parent rocks (FAO, 1988 and Gourou, 1973). The fertile lowland soils include (1) the 700,000 ha in the Red River Delta, (2) the 500,000 ha in the Mekong River Delta, and (3) a few other hundred thousand hectares in the deltas and valleys formed by a series of small rivers throughout the country. These soils are young alluvial soils formed from rivers and marine alluvium. The best soils belong to Eutric Gleysols and Pellic Vertisols. Eutric Gleysols are fairly fertile and continuous rice cropping is successful when irrigation and drainage are good. Pellic Vertisols are susceptible to water erosion if no protective measure is taken. Water deficit is the main constraint in these soils, but with adequate irrigation the soils are well suited to wetland rice production (Dent, 1980). However, prolonged submergence has reduced zinc availability in these soils. Table 1 shows some major characteristics of the fertile alluvial soils found in Hà Tây, Vĩnh Long and Cần Thơ. The soils in some areas of the Red River Delta, the Central Coastal Region and the North-East-South regions have become more acidic after years of intensive cultivation. The top layer of these soils is often acidic (pH 4-5) and has a pale color. The contents of sand and silt of these soils are higher compared to the fertile alluvial soils (Table 2). Therefore, these soils have low cation exchange capacity (CEC), Below the top layer, the degraded alluvial soils usually have a more clayey and strongly mottled B horizon. Rice root cannot easily penetrate to this B layer to find nutrient and water. Figure 1 shows the distribution of acid sulphate soils, saline soils and tropical organic soils in Vietnam. Acid sulphate soils occupy about 50,000 ha in the northeast of the Red River Delta and about 1.45 million ha in the Mekong River Delta. The acid sulphate soils in the Mekong River Delta can be divided into strongly acid (530,000 ha), intermediate acid (500,000 ha) and weakly acid (450,000 ha) groups (FAO, 1988). The top layer of strongly acid sulphate soils (Sulfaquepts) has ph < 3.5 and excessive content of iron and aluminium in soil solution (Van Bremen, 1980, Lê Quang Minh et al, 1995). They are found in poorly drained swamps of Đồng Tháp Mười and Tứ Giác Long Xuyên before. The top soil layers of intermediate and weakly acid sulphate soils (Sulfic subgroups) are less acidic and pH > 4. Lowland rice can be successfully grown to weak acid sulphate soils. On intermediate and strongly acid sulphate soils rice plants could not satisfactorily develop due to high content of sulphur (S), iron (Fe) and aluminium (Al). This was the reason the swamps of Đồng Tháp Mười and Tứ Giác Long Xuyên were not used for rice production before. With the programes to dig irrigation and drainage canals today the majority of acid sulphate soils in Vietnam have been improved for rice production. In the Mekong River Delta there are about 650,000 ha of saline soils (Eutric Fluvisols) along the coastal belt. In the Red River Delta there are about 350,000 ha of saline soils. saline soils are also found in coastal areas of the central region (FAO, 1988, and Fig. 1). Most of Eutric Fluvisols have moderate to high inherent fertility, but a saline phase in these soils limits their potential for wetland rice production (Dent, 1980). Fortunately, the saline phase in most Eutric Fluvisols in the Central Coastal Region is weak (Boje-Klein,1986). Saline soils have a high salt concentration in the root zone of rice and the electrical conductivity in saturation extract (ECe) at 250 C is more than 4 mmho/cm. Thionic saline soils (acid sulphate), as in the Mekong River Delta, may have problems of aluminium and iron toxicity as well as phosphorus deficiency. Most rice varieties are severely injured in flooded soil cultures with an ECe of 8-10 mmho/cm at 250 C. The symptoms of salt injury in rice are stunted growth, rolling of leaves, white tips, and drying of older leaves. Salt injury during the reproductive phase causes grain sterility. In the Red River Delta, the area of waterlogged and peat soils is about 100,000 ha, while in the Mekong River Delta, there are about 170,000 ha of peat soils, which underlay the acid soils with pyritic materials (FAO, 1988, Fig. 1). The main constraints to rice production in peat soils are unfavorable physical characteristics – such as irreversible drying, low bearing capacity, and poor anchorage of roots – and very low fertility. Surface drainage is essential for lowland rice cultivation as it promotes mineralization. Large quantity of rice is lost every year due to damages caused by insects, diseases, weeds, and others. So far, brown plant hoppers and stem borers are major insects that cause large damage on rice crops and yield. Among the rice diseases, leaf and neck blast, and grassy stunt are major diseases affecting rice yield. In the fields, rice crops are also damaged by rats and recently the golden snails. Brown plant hoppers (Nilapavata lugens Stal) are serious rice insects in southern regions, especially the Mekong River Delta. During 1974-1975 seasons, the outbreak of brown plant hoppers occurred and damaged several hundred thousand hectares. In 1978 new brown plant hoppers, biotype 2, damaged nearly 700,000 hectares. In 1991, new biotype of brown plant hoppers biotype 3 damaged 1.3 million hectares of rice and about 750,000 ha in 1992 (Darymple, 1984 and Anynomous, 1994). In 2006, brown plant hoppers and grassy stunt again destroyed several hundred thousand hectares in Mekong River Delta. Damages due to stem borers, especially the pink stem borers (Sesamia inferens) are regularly found in many places. Damages in some cases may reach 10% of total production if they take place during reproductive phases of rice (Anynomous, 1994). Damages due to stem borers are generally important in areas planted to scented/aromatic varieties (Nguyễn Văn Luật, 1994). In 1991 stem borers caused considerable damages to about 264,000 ha of rice in Mekong River Delta. The other rice field insects are leaf rollers/miners (Cnaphalocrocis medinalis), green leaf hoppers, the stink bugs (Leptocorsia sp. ), and grass-hoppers/locusts. 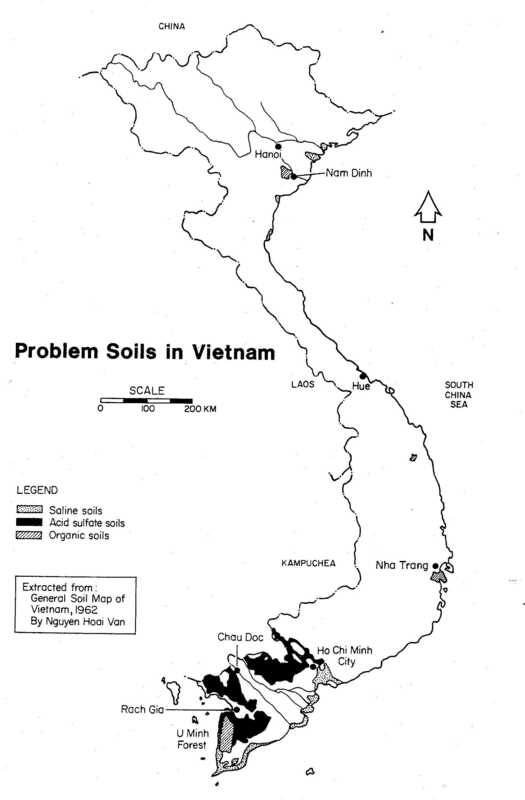 In 1992, grass-hoppers/locusts damaged about 50,000 ha in Mekong River Delta (Anynomous, 1994). Grain weevils (Sitophilus oryzae) and grain borers (Rhizopertha dominica) are the main storage insects (Mỹ Yến Lâm, 1993). Blast (Pyricularia oryzae Cav), both leaves and neck, are serious rice diseases in the Red River Delta and the lowland areas in the north central coastal region, especially during winter-spring season. In 1992, more than 300,000 ha of winter-spring rice in the Red River Delta were reported to be heavily damaged by blast (Trung, 1993). Similar large-scale damages caused by blast was also reported (Anonymous, 1994). Rice variety CR 203 was popular in the Red River Delta and the north central coastal region, especially in Thừa Thiên, during 1995-1996 seasons (Nguyễn Văn Ngưu, 1996) – because of its capacity to resist blast. Grassy stunt virus transmitted by brown plant hoppers (Nilaparvata lugens Stal) damaged rice planted in about 70,000 ha in Mekong River Delta in 1991 and recently together with brown plant hoppers they damaged several hundred thousand hectares of rice in Mekong River Delta in 2006. Bacterial leaf blight (Xanthomomas oryzae) is a major disease of rice in the Mekong River Delta and sheath blight (Rhizoctonia solani Kuhn) incidences have been increasingly observed, especially in the Mekong River Delta, where direct seeding with high seed rates and high doses of nitrogen fertilizers were used. Storage fungi such as Aspergillus and Penicillium species may develop on grains with 12 to 18% moisture content (Mỹ Yến Lâm, 1993). Weeds compete with rice plants for nutrient, water and solar radiation. Therefore, they reduce the growth, yield and the quality of rice in all agro-ecological systems. There are many weed species in rice fields. Among them, the barnyard grass (Echinochloa crus-galli) is the most important in lowland rice fields. Bùi Huy Đáp (1985) reported that yield of transplanted rice in Red River Delta reduced by 12% to 33% depending on the population of barnyard grass in the fields. Table 3 shows the weeds in Vietnamese rice fields. A number of these weeds, for example Rau má (Centellia asiatica), Rau khúc tẻ (Gnaphalium indicum), Rau rệu (Allernathera sossilis), Rau dừa (Justaca repens), Cải dại (Masturtium indicum), Rau chóc (Monochoria vaginalis), Súng lam (Nymphaea steliata) and Rau muống dại (Ipomea aquatica) are used by the Vietnamese people as food and/or to feed to animal. The following popular song in the South talks about this. Điền điển (Sesbania javanica) and Cỏ mai vịt (Urochloa reptans) are good biological/green fertilizer. Recently, Lúa ma, lúa đỏ – wild rice, red rice – (Oryza spontanea) have been reported to be increasingly infested rice fields where farmers practiced direct seeding in crop establishment in the Mekong River Delta (Dương Văn Chín et al., 2000). Rat damages may be severe from time to time. For example, rats heavily damaged about 44,000 ha of the winter-spring rice in the Đồng Tháp Mười in 1991/92 (Anonymous, 1994). The field crabs and snails also damage rice plants. However, they are also good sources of food to Vietnamese. In the past farmers collected them for their own consumption or to sell in the markets. Black snails (ốc bưu) that were boiled with ginger and tamarin leaves were special dishes. Recently, however, golden snails have become a major pest in rice production. They eat leaves of newly transplanted seedlings. Van Bremen, N 1980 Acidity of Wetland Soils, including histosols as a constraint to food production.